Ford and Hertz rental cars have had a special relationship going back decades. This relationship saw some very hopped up Shelby cars offered as rentals back in the ’60s and the tradition is continuing. Ford and Hertz have announced that starting this Memorial Day weekend in the US it will begin offering rentals for a special version of the 2016 Mustang GT dubbed the Shelby GT-H.
Hertz will take delivery of 140 2016 Ford Shelby GT-H cars that will be offered at select airport locations in the US via the Hertz Adrenaline Collection. 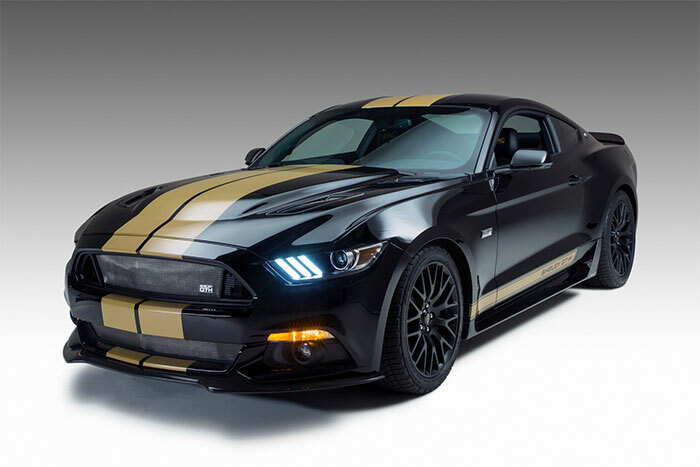 The special Mustangs have black paint, gold stripes and Shelby GT-H stickers on the side. Each car will also have a numbered badge inside. The cars are fitted with the Ford Racing Handling Pack and have 19-inch wheels with high-performance tires. The car also has a special Shelby vented hood. These aren’t GT350 cars mind you; it’s a dressed up standard Mustang GT. That is too bad; it would be awesome to rent a GT350 to spend a weekend driving around. It looks like these GT-H cars might be as close as you can get.